This week's tip comes courtesy of one of our furry friends. I have been wanting to put together a little DIY Stain Removal Kit for quite awhile, and this weekend I bumped up the urgency after a sick puppy incident. 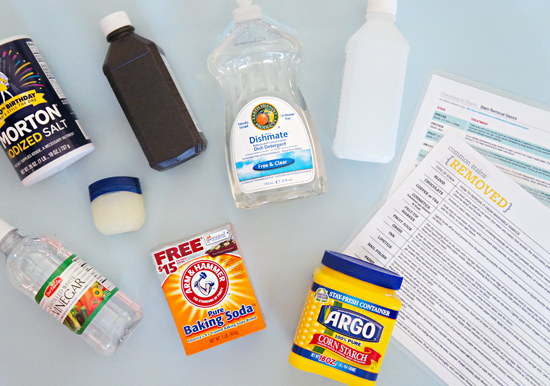 We switched to homemade cleaners a few years ago now, and when we made the switch we also tried to reduce the number of bottles of stain remover we are purchasing for carpet, upholstery and clothing. In fact, I never found any that worked all that great anyway and have done a lot of reading about how everyday household products do just as well. My problem is that by the time I check out my stain removal guide, I then end up rummaging through my cupboards in hopes that I have everything I need on hand. Sometimes I do a celebratory dance, sometimes I hear that whomp whomp sound. When it comes to these stain removers, different types of products work better on specific types of stains. Makeup, sweat, puppy accidents, crayon, grass stains, chapstick, ink, wine and paint stains.... And let's face it, with three boys we see a lot of clothing stains. Oh, who am I kidding? I stain far more things than they do! I am not a stain removing expert, I definitely had to do some reading. 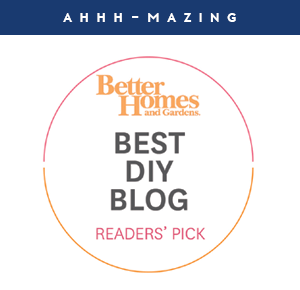 I found a lot of really helpful information on my two favorite websites; Better Homes & Gardens (also here, here and here) & Martha Stewart. Because a) I am me b) original packaging is bulky c) original packaging is visually cluttering and d) I plan to keep this kit on hand for many years to come, I decanted the everyday household products into a few small glass bottles (found at HomeGoods) and shakers (found at our local grocery store). This is not at all a necessary step. 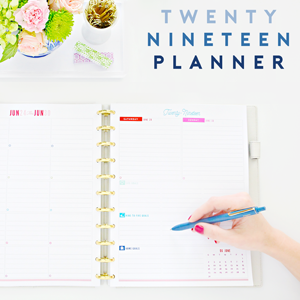 Just one if you are a lover of all things pretty and organized. UPDATE: Thank you to my special readers, they informed me that you should NOT place peroxide in clear containers, so it should at least be frosted or left in the original packaging. I also used my Silhouette to create some vinyl labels which should stay strong even if they get wet. I stuck everything in an empty bin, which will also double as a soaking tub ,and placed it on our counter in the laundry room. I also laminated and hung the stain removal tips and charts on a command strip behind the kit. 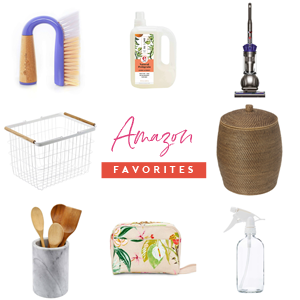 I also appreciate that I learned a lot about the additional uses for everyday household products that we already have stocked in the kitchen and medicine cabinet. I had no idea you can use petroleum jelly to prevent a stain from spreading. Or that simple dishsoap works just as hard on stains as it does on dishes. Now we have everything at our fingertips anytime we create a stain. And yes, that is a frequent occurrence here, so I am pretty excited to have it all in a single location. Also, the fact that it turned out so stinking darling and it can live anywhere in the laundry room is a sweet little bonus. 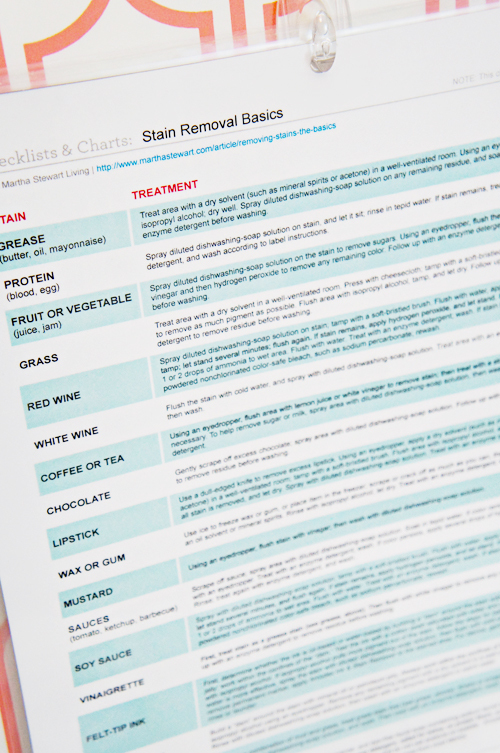 Do you have a no-fail secret stain fighting recipe? Care to spill it? Hi Jen - this is a great idea. Here is an idea to step it up further and make your soaking tub even more accessible: get a caddy that could fit these thing and fit inside your soaking tub. I am thinking of the ones that I have seen at IKEA which are a caddy that fits straight into a bucket. I wonder if there is one small enough? Your quick tips are my new favorite posts! Love that idea! We already have a bulky mop bucket/caddy combo which is similar, however, I haven't found anything more compact for storing on shelves. It is definitely something worth keeping in mind! Thank you Teresa! I love this idea Jen! 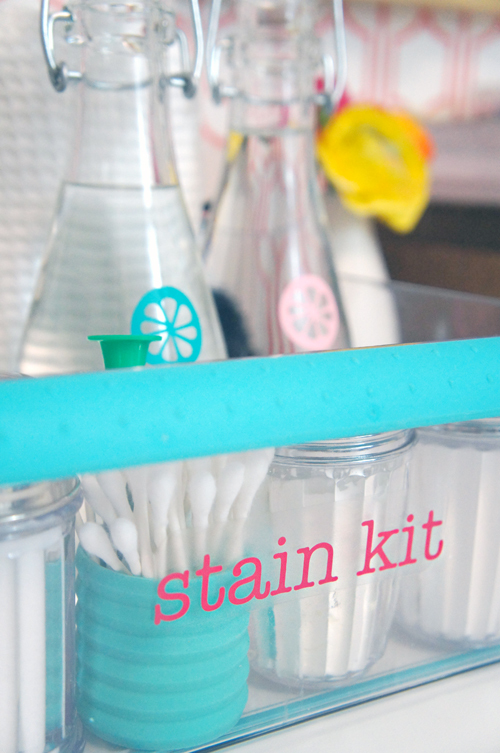 Super inspired to create a little stain kit myself. Do you have any suggestions for labelling without a Silhouette? I'd love one but they don't have them in Australia. Other options would be to use a Sharpie or Oil based marker/pen. Jen, you forgot one of your favorite items...washi tape! it can be expensive though so I personally use Scotch brand expressions to label my diy cleaners. As well as bins and boxes and leftovers...everything but the dogs! while i do applaud your efforts to make everything pretty (you're so darn good at it...i'm jealous! ), you might want to keep your peroxide in its original bottle. the reason it comes in those ugly brown bottles is to keep it from losing its chemical properties. from what i understand, it can turn into plain water if stored in clear bottles that expose it to light. it's worth a google for sure. Oops! At least it is easy enough fix. I am SO happy to have readers like you that let me know, it is one of the main reasons I heart to blog! Thanks so much, I have updated the post as well. xoxo! Such a beautiful kit and so useful! Just wanted to to be aware that peroxide breaks down in the presence of light. Maybe you could spray paint the bottle black. I keep an old hair spray on hand for ink stains. This is such a great idea! I totally need this haha. Whenever I wear white I sweat dirt just jumps on me!! Shaving cream works great for removing paint from clothes and skin. I thought my son had ruined his brand new shoes after stepping in orange paint, but my husband got it all off with regular, old shaving cream. This is such a great idea! Right now it's just my husband and I but soon we'll have a little munchkin making tons of messes. My parents also have 6 little kids spilling things everywhere, and this would definitely come in handy! The best part I think is that you have the laminated list that shows what works best for which situation. All I know is the faster you get to the spill, the more likely you are to save it from staining. 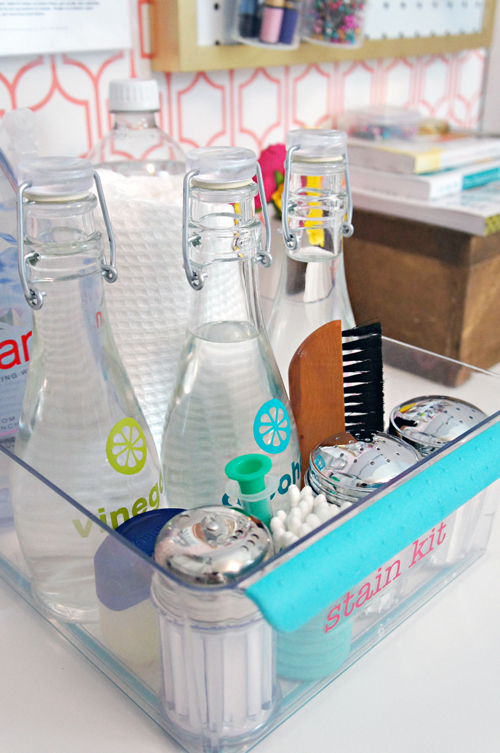 We're trying to make the switch as well...I already have the cutest spray bottles, ha! Years ago I read something from Martha Stewart about using ice, just a regular ol' ice cube, to help remove stains. I wasn't exactly a believer until...my toddler dipped his whole arm into a can of latex paint and got paint everywhere, including our carpet. After cleaning my little guy up, I attacked that carpet with ice cubes until my fingers were completely numb, and it worked! I couldn't believe it! Nearly every trace of that paint was gone! Now I use ice as my first line of defense for any stain on carpet or clothing. This won't ruin colored carpet? my tip is liquid dish soap works well on oil based stains (like salad dressing splashes) since it is made to cut through grease! First, let me say I've been following your blog for over two years now, and it is by far, hands down, my favorite. 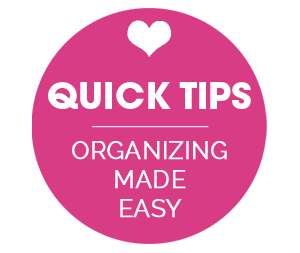 You offer so many practical tips, and teach us how to organize and "beautify" our homes! 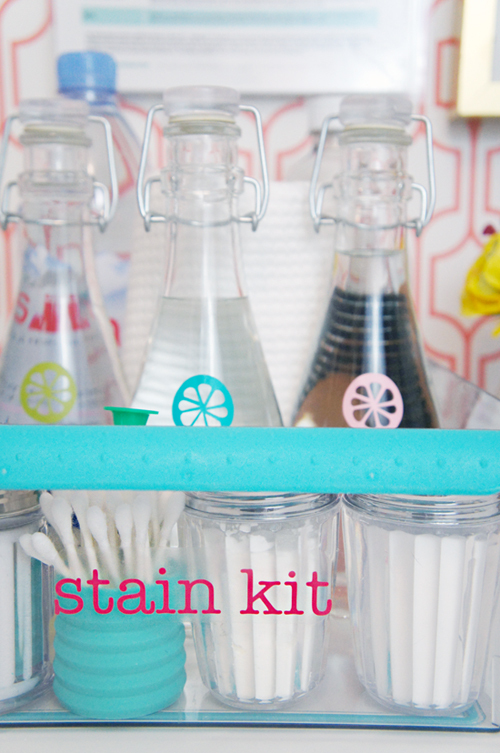 Second, I LOVE this stain removal kit. It is so practical, and allows use of common household products. I can't wait to put one together. Where can we find the stain removal guide you feature? It'd be such a great resource! I linked to both within the post. :) xoxo! They are linked within the post. :) xo! Have the book sitting nearby and love it! For those of us who have not made the move to homemade cleaners yet I have found that Scrubbing bubbles bathroom cleaner will take any stain out of any carpet/upholstery! It also removes any trace of scent so it is great for pet stains too. How about old, set in stains? This is such a great idea and the entire kit looks so cute as well! Hi Jen -- Can you share where your bin is from? I love the turquoise handle! Hello! It is a bin typically used for organizing the fridge and pantry - found at HomeGoods. xoxo! I absolutely love this idea! Thanks so much for sharing. It was actually only yesterday that I was stressing about some stains in my house and when I looked up how to fix them I didn't have the items required in my cupboard. I will definitely give this a try although mine will probably never look as adorable as yours. 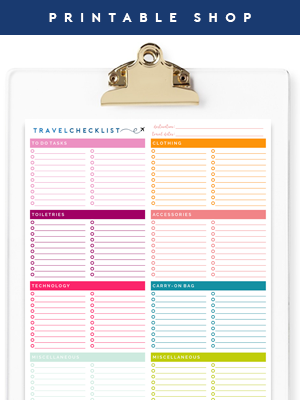 Love all your blog posts - I am desperately trying to find a UK version of the silhouette so I can label and organise away to my hearts content. I'm truly thankful that I've found your blog, and if I've only command hook / clipped my rubber gloves to the inside of my under sink cupboard, that cupboard and my sanity are all the better for it! Love reading about your lovely home, can. not. wait. for the next! You always make even the simpler things look so beautiful Jen! In cleaning out the refrigerator of old condiments, I discovered that these make great bottles to use to store cleaning liquids. They usually do not have metal parts that can corrode, are plastic, and have that smaller opening to control the amounts being poured. I have a separate non-food use funnel to help in pouring into these smaller containers. I also use Dawn dishwashing soap to pretreat a greasy stain. I use bleach in certain cleanup situations, but beware that bleach and vinegar mix produces toxic fumes. Another suggestion is to get some aprons - it helps in the kitchen when you don't have time to switch from that good shirt. 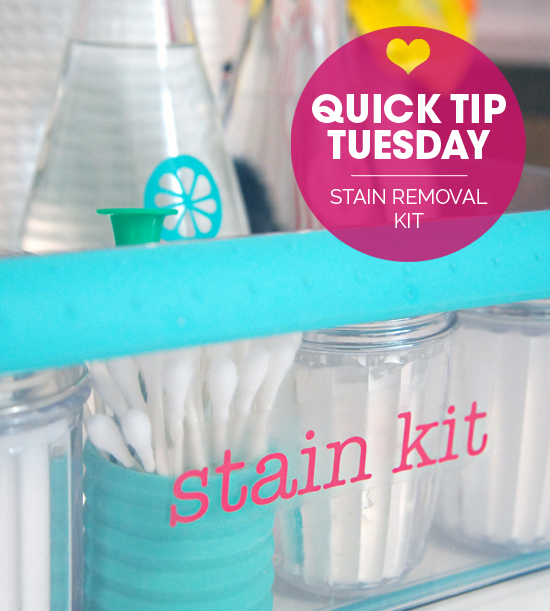 And stashing one in your stain container may help when you are cleaning - yea, I get messy too! On here you used to have a printable that listed all your recipes that you use to make your own cleaning supplies. I do not see it on the printables page though. Do you mind telling me where I can find it? Hello! I linked to the chart sources within the post. :) xoxo! OMG I absolutely LOVE this idea. And could it be any cuter?!? You've given me a new task...can't wait to out together this one! This seems like an amazing thing to keep on hand! Especially because I'm so clumsy and always spilling things! Do you have a cheap way to make the label on the front? This is a brilliant idea!! Thank you! Also, where did you get the cute q tip holder? Lovely idea! I'm making such kit for my sister. She'll be so glad to have everything she needs for cleaning the stains her sons remain in one place. The boys are making messes hundred times a day and she's cleaning all the time. Thank you for the idea! I would love to know why you chose each item. Most websites I've found list the type of stain and then offer the solution which obviously makes sense but I think listing stain removers and what they can do would be useful, too.